To Code or Not to Code (in intro statistics)? 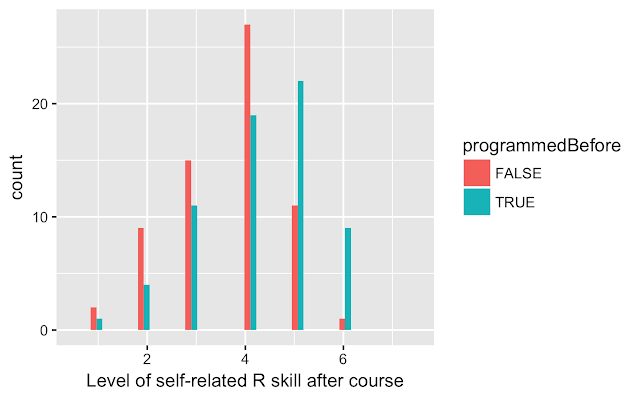 The emphasis on learning R was valuable because I feel that I've gained an important skill that will be useful for the rest of my college career. R coding. It is super difficult to learn as a person with very little coding background, and made this class feel like it was mostly about figuring out code rather than about absorbing and learning to apply statistics. My feelings are torn on R. I understand that it's a useful skill & plan to continue learning it after the course (yay DataCamp), but I also found it extremely frustrating & wouldn't have sought it out to learn on my own. I had never coded before, nor have I ever taken a statistics course. For me, trying to learn these concepts together was difficult. I felt like I went into office hours for help on coding, rather than statistical concepts. Many of the students in the class come from humanities departments where they would likely never have a chance to learn coding. I consider computational literacy (including coding) to be essential for any student today (regardless of whether they are from sciences or the humanities), and this course provides those students with a chance to acquire at least a bit of skill and hopefully inspires curiosity to learn more. Analyzing data by pointing and clicking is inherently non-reproducible, and one of the important aspects of the course was to focus the students on the importance of reproducible research practices (e.g. by having them submit RMarkdown notebooks for the problem sets and final project). A big part of working with real data is wrangling the data into a form where the statistics can actually be applied. Without the ability to code, this becomes much more difficult. The course focuses a lot on simulation and randomization, and I'm not sure that the interactive packages will be useful for instilling these concepts. I'm interested to hear your thoughts about this tradeoff: Is it better for the students to walk away with some R skill but less conceptual statistical knowledge, or greater conceptual knowledge without the ability to implement it in code? Please leave your thoughts in the comments below.